Spend some time learning about the fascinating history of one of New Orleans' oldest neighborhoods with this 2-hour French Quarter and cemetery walking tour. Meet your guide in the heart of the French Quarter to begin exploring this famous district. Founded in 1718 by famed French-Canadian explorer Jean-Baptiste Le Moyne, Sieur de Bienville, New Orleans (and more specifically, what is now called the French Quarter or Vieux Carre) has been home to many colorful inhabitants and happenings. In its early beginnings as a French Colony, the city was first settled with Paris' most notorious prison outcasts before the addition of European aristocrats, the land-owning gentry. This strange mix of hedonism and money attracted purveyors such as Voodoo practitioners, saloon keepers, and women of the night. Venture into the most famous cemetery in New Orleans, St. Louis No. 1. 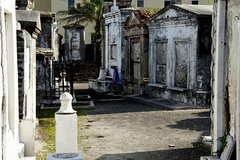 This hollowed ground boasts the final resting place of famed Voodoo Queen Marie Laveau and a tomb owned by the still-living Nicholas Cage. Places you'll see and things you'll hear about throughout the tour include the Mississippi River, Jackson Square, The Cabildo, The Presbytere, St. Louis Cathedral, The French Market, Café du Monde, Madame John’s Legacy, the Baroness Pontalba, Andrew Jackson, The Battle of New Orleans, The Louisiana Purchase, Marie LaVeau, Jean Lafitte, and more.